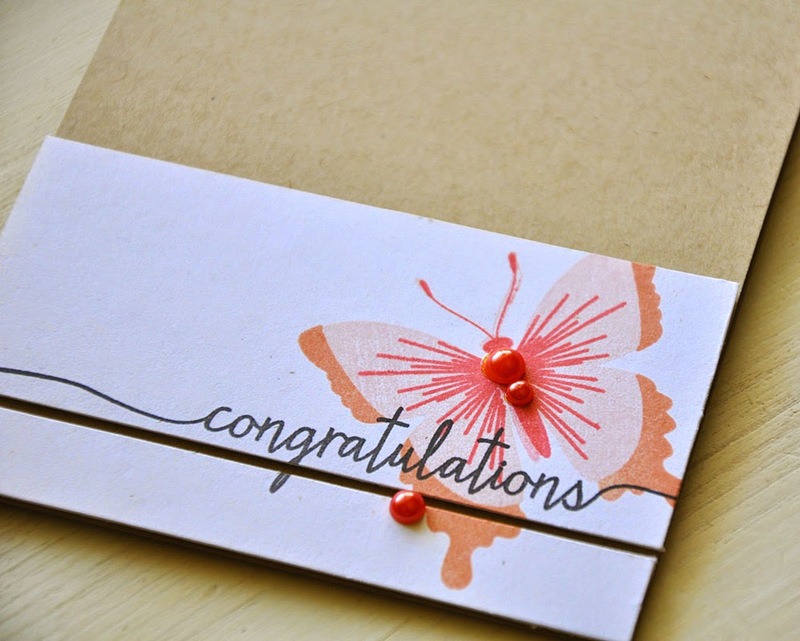 The Papertrey Ink February countdown is about to come to an end and I'm here to share my final projects with you today. But, before I do, let me remind you that everything you've seen peeks of will be available for purchase through Papertrey Ink beginning 10 pm EST tonight. Quilted: Spring by Betsy Veldman and Swoosh. 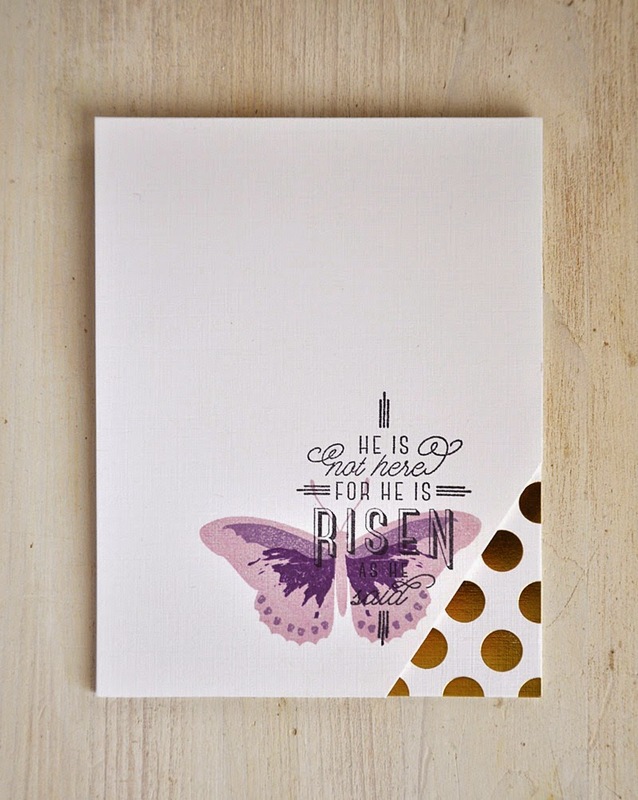 Easter Alleluias by Betsy Veldman and Beautiful Butterflies Layers. And some Luxe Foil Gold Paper Collection. Bitty Bouquets by Betsy Veldman. And some Watercolor Wonder paper pad. Etched Easter Eggs by Lizzie Jones and Monthly Moments: Year Round by Heather Nichols. 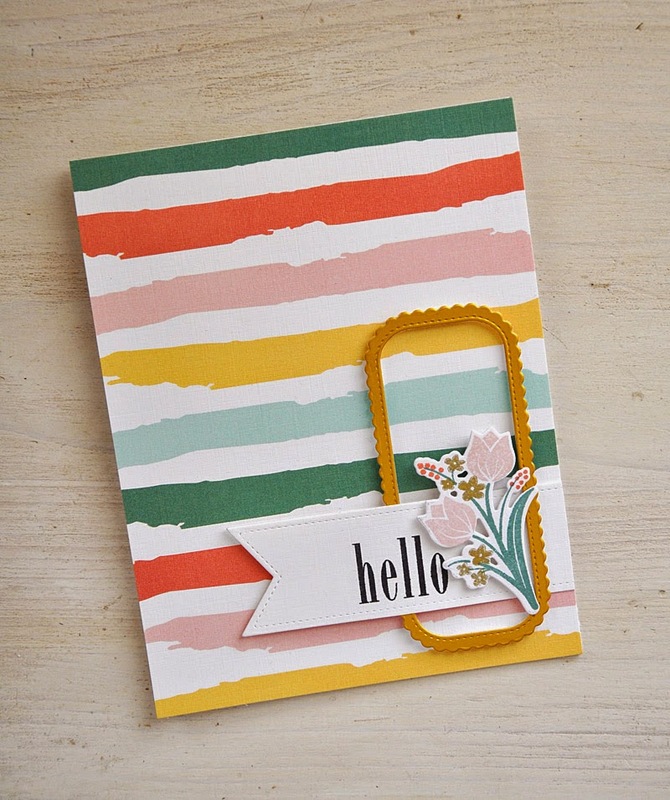 Everyone at Papertrey Ink is excited to share the news of Betsy Veldman's new Make It Market Mini Kits! The first one being released this weekend, on Sunday, February 15th. To help celebrate, the entire design team is participating in a little scavenger hunt! 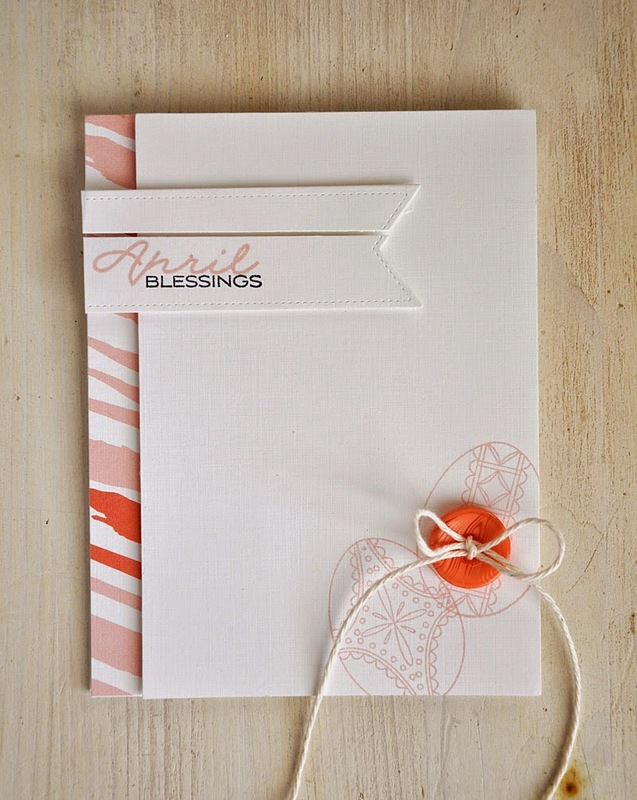 Be sure to visit Nichole's blog for all the details so you can play along! EIGHT $80 Papertrey Gift Certificates will be awarded to the participants! Hello and welcome to day 9 of the Papertrey Ink anniversary festivities! One of the coolest items in this months kit is the laurel die. 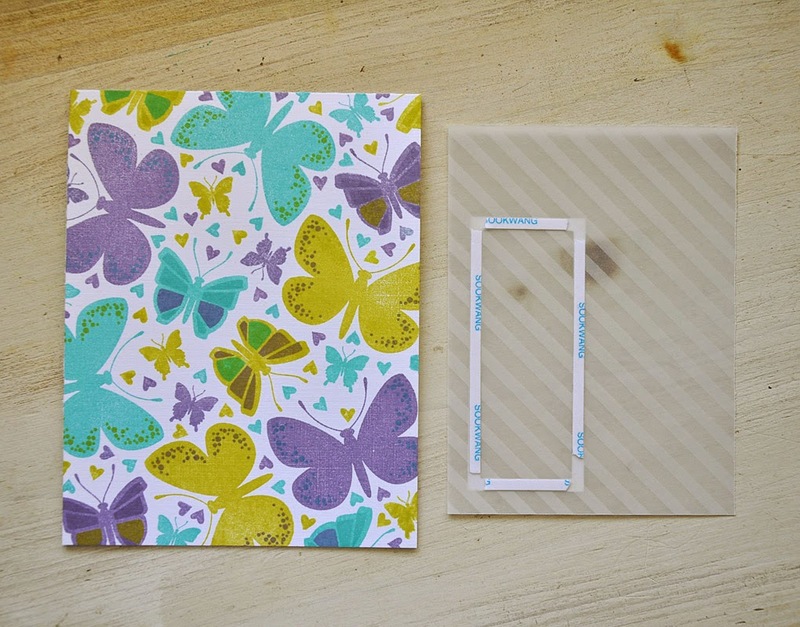 I used it along with a sheet of my favorite piece of pattern paper from the kit. I love how, after trimming away the edge under the laurel, the pattern paper peeks out from the edge as well as under the die cut laurel. The Luxe Gold bow is pretty perfect too! Here's a bit more of a softer look. This time the laurel was stamped, without the use of the die, just over the edge. I just love these darling flower sequins. They are like little cups, ready to be filled with glitter! 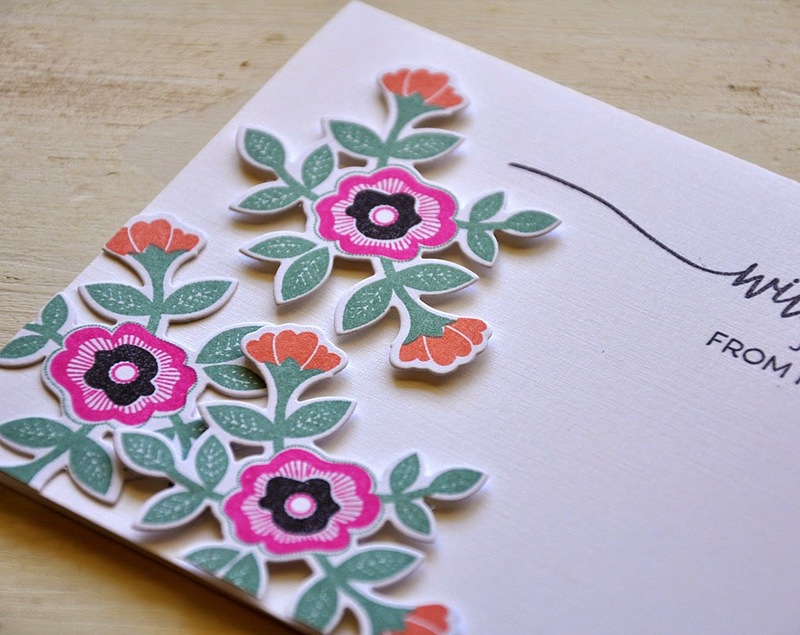 I used a bit of glossy accents to... First, attach the flowers to the card. Second, fill another dot of glue inside and cover with glitter. So lovely! I couldn't leave today without a couple samples using my new Stamping Simply product for the month. I grabbed a sheet from the Watercolor Wonder paper pad to create a more masculine birthday card. Trimmed it into two pieces to fit a sentiment inside. 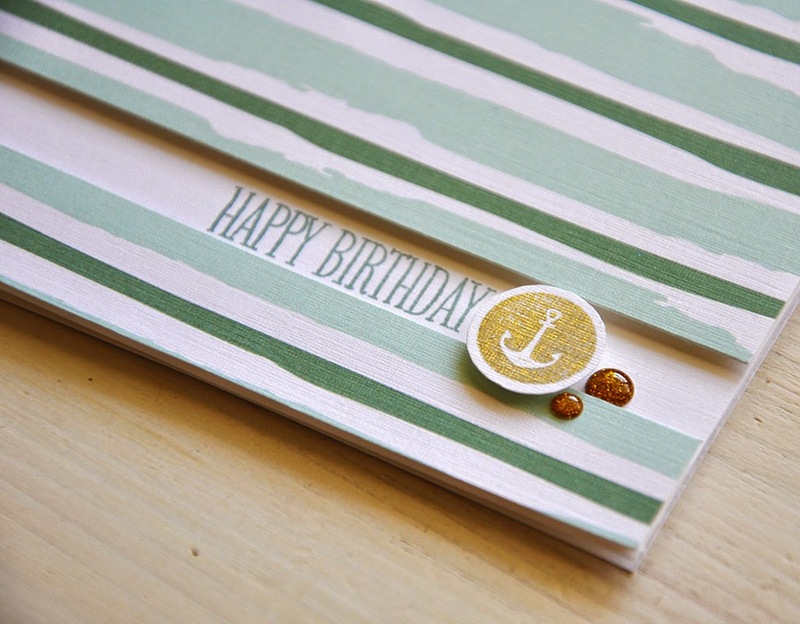 Embellished with a stamped gold anchor circle and gold dots, both are from the Bountiful Banner stamp set. Super simple! This one on the other hand... not so simple but, oh so beautiful! 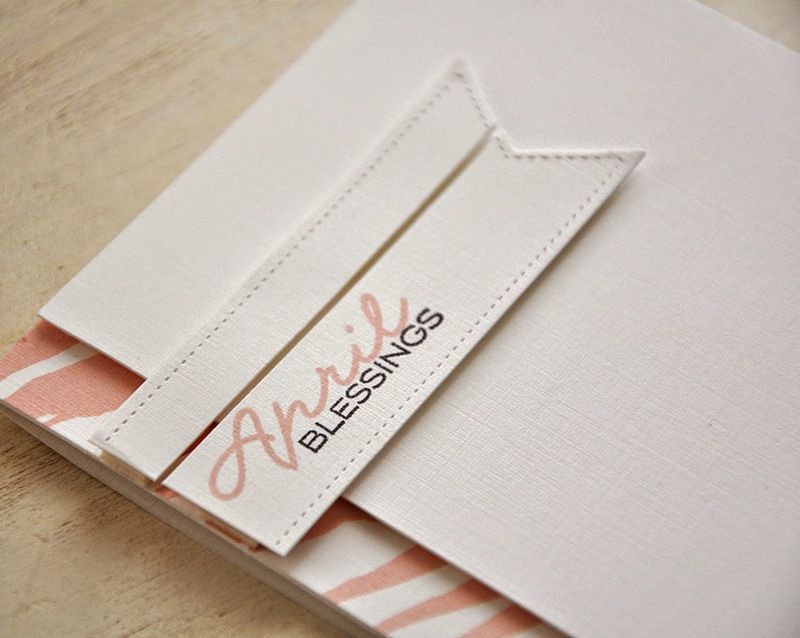 It all began with this hand stamped pattern. 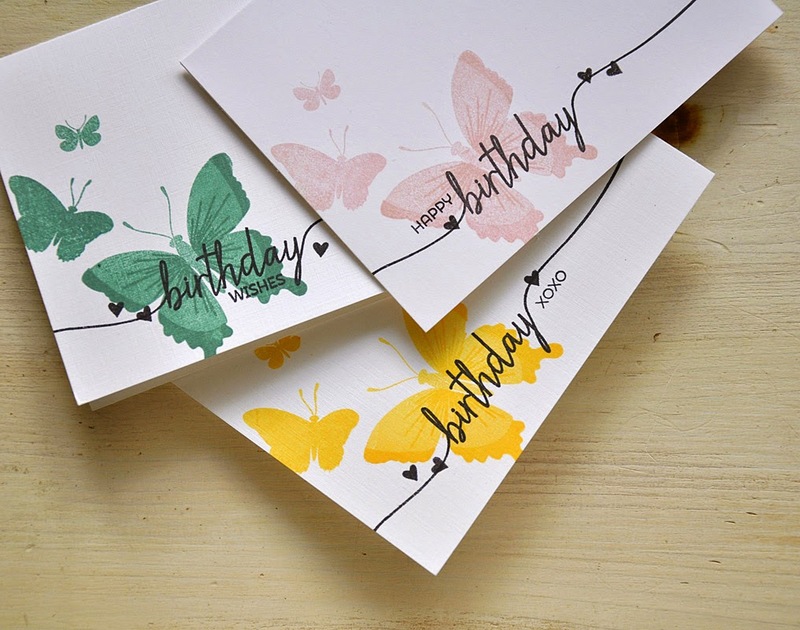 Images are from the Beautiful Butterflies (solid butterflies), Beautiful Butterflies Layers (butterflies details) and Swoosh (tiny heart) stamp sets. Here's How: I began stamping this random pattern from the bottom right corner and moved my way all the way up. 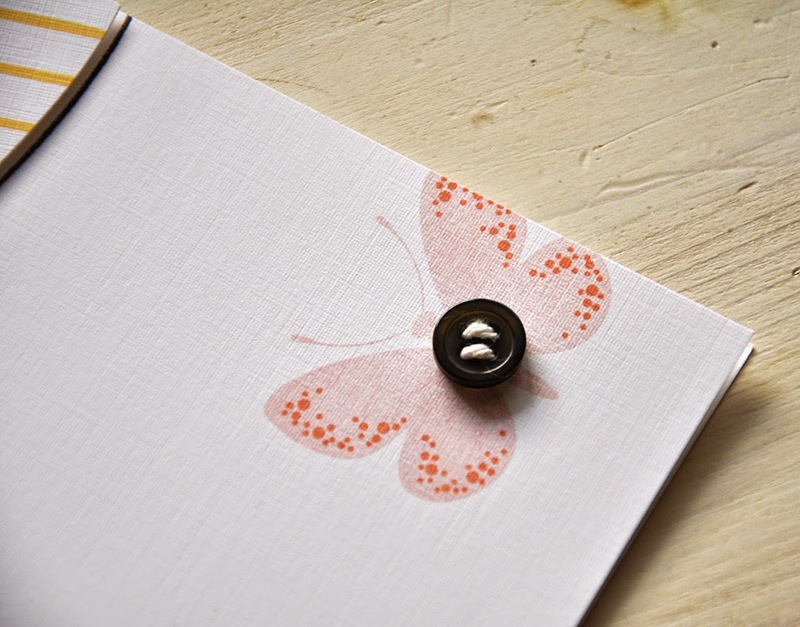 Once all butterflies covered the cardstock I filled in all space with the tiny heart. The vellum was attached with a bit of adhesive, hidden behind the frame. The striped vellum allows the pattern to show through, but it also softens up the bold color combo of limeade ice, winter wisteria and Hawaiian shores. Well, that concludes my look at the new Make It Market Mini Kits. Just remember... the products you've seen today will be available for purchase through Papertrey Ink, beginning February 15th. Hello and welcome to day 8 of the Papertrey Ink anniversary festivities! Find more info on these products on the Papertrey Ink blog. First up, a little something for those times when we forget. The "birthday" is from the new Swoosh stamps set. Everything else is from Blue Skies! The air plane was rolled into both blueberry sky and enchanted evening inks. 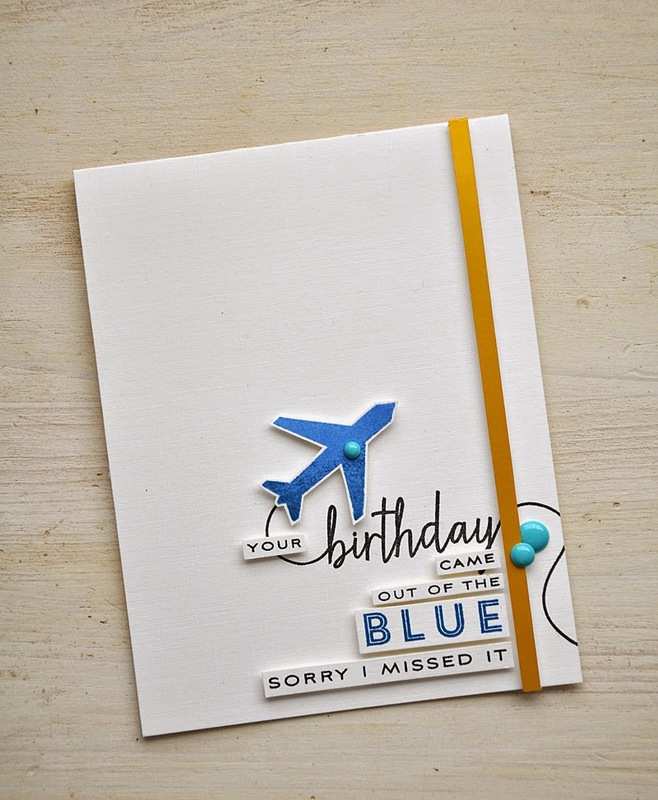 The planes contrail was created using the "birthday" sentiment from Swoosh, I simply tweaked the ends as I applied it onto my acrylic block. 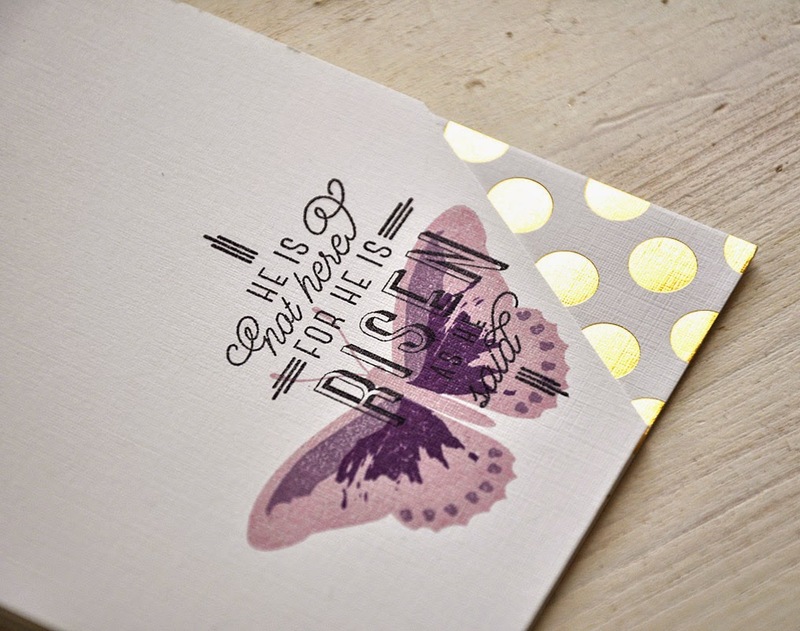 Finished the card off with a strip of Luxe Gold cardstock and enamel dots. This bright little number utilized the extra long triangle image. Instead of creating sun rays with it, I stamped a cool rainbow! 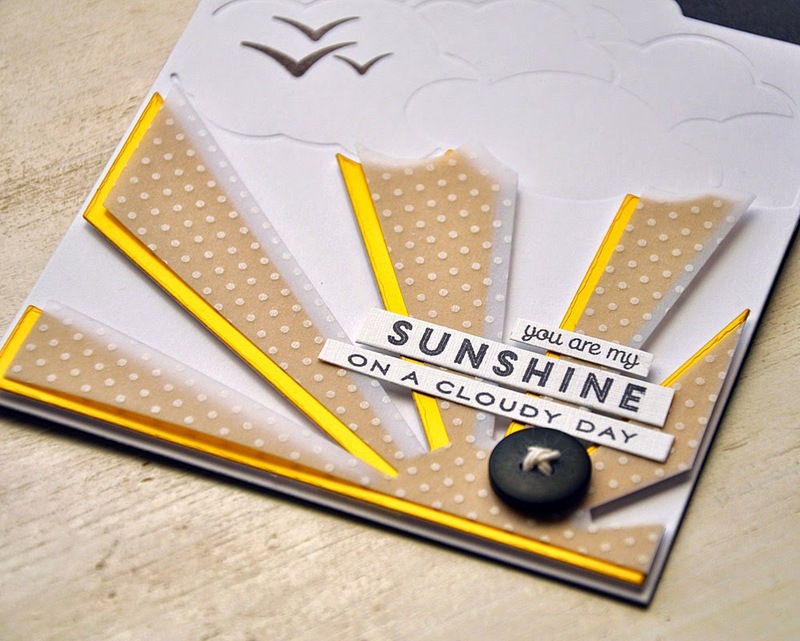 The clouds were cut using the Blue Skies dies, from the new pattern vellum pack. 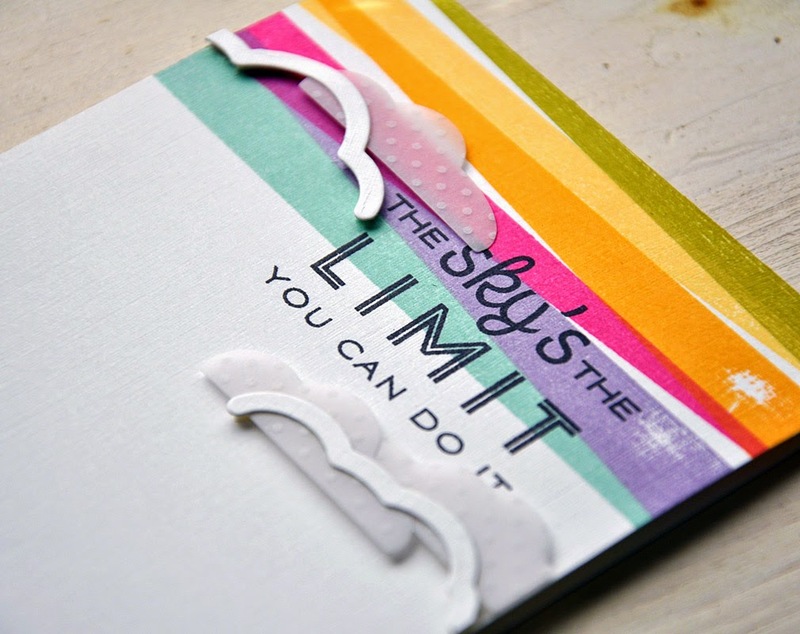 A little trick... the dimensional adhesive was hidden behind the white cardstock pieces. 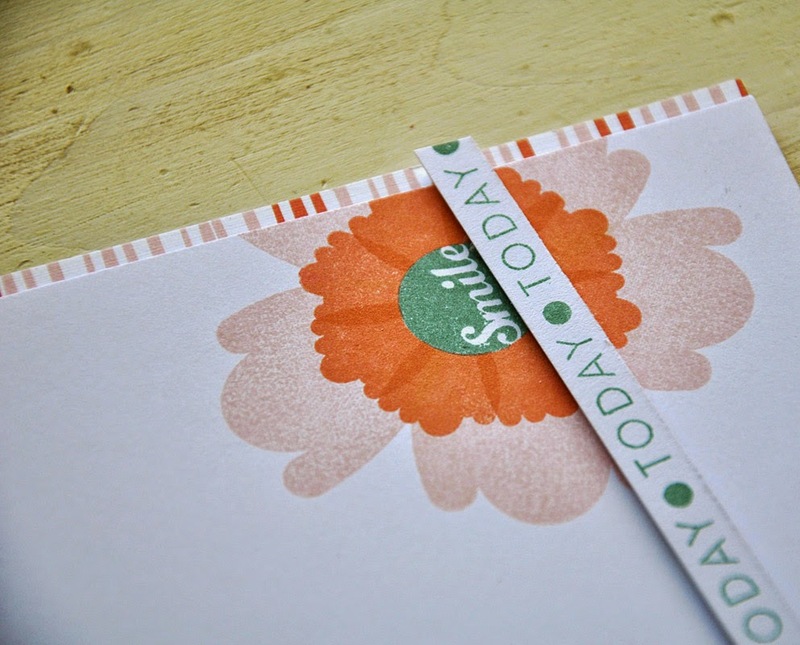 This one's sure to brighten any gloomy day. I used the new Cover Plate: Blue Skies and Cover Plate: Blue Skies Rays dies. 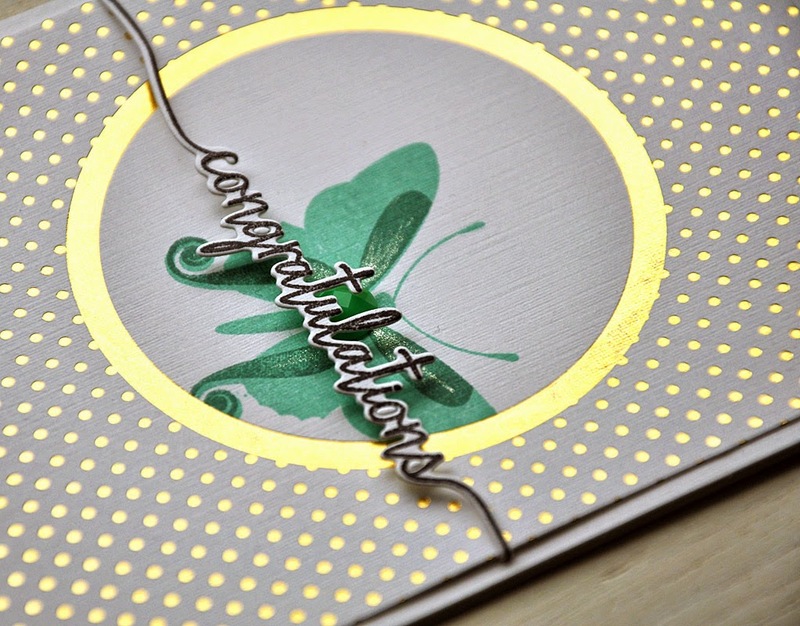 The Luxe Gold cardstock really shines as it peeks out from the die cut polka dot vellum. 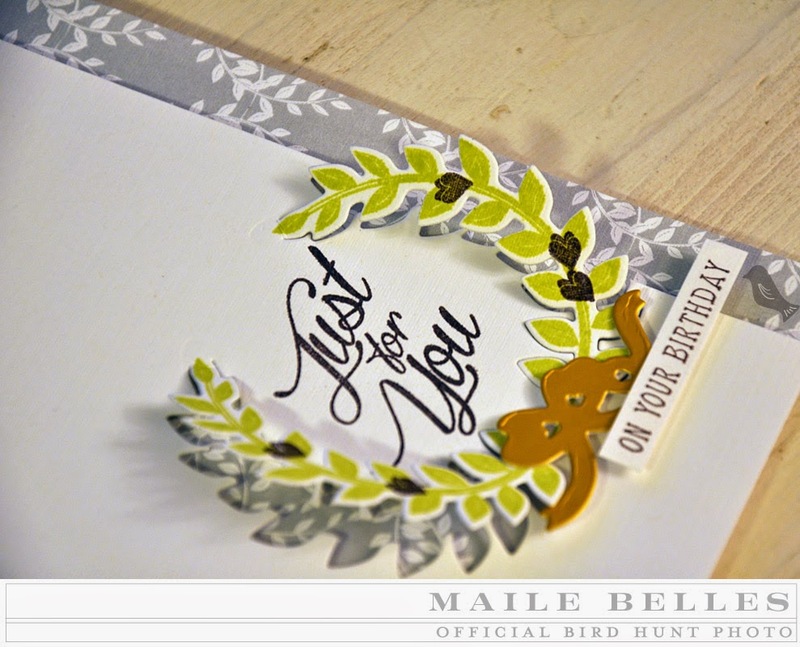 Birds and sentiment from Blue Skies stamp set. 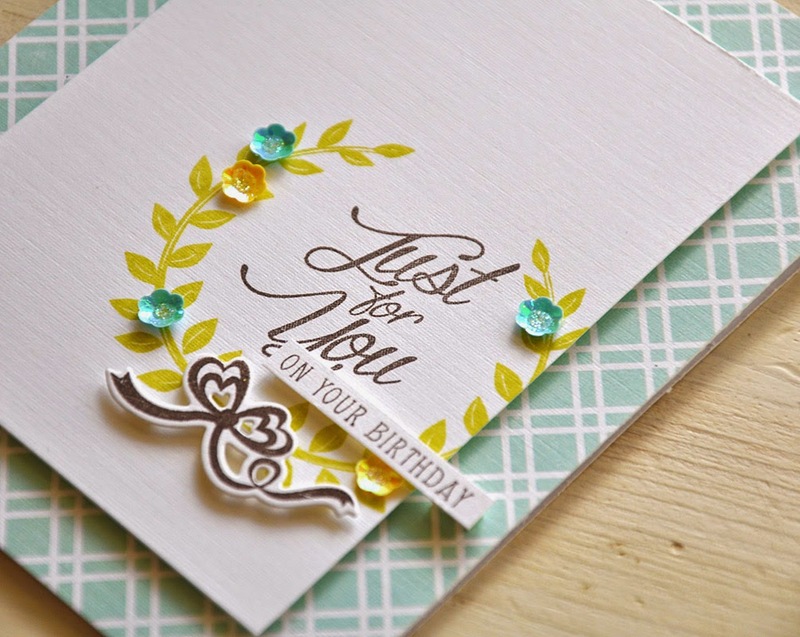 I used the extra long triangle die, included in the Blue Skies die set, to die cut strips from Luxe gold cardstock and the Watercolor Wonder paper pad. 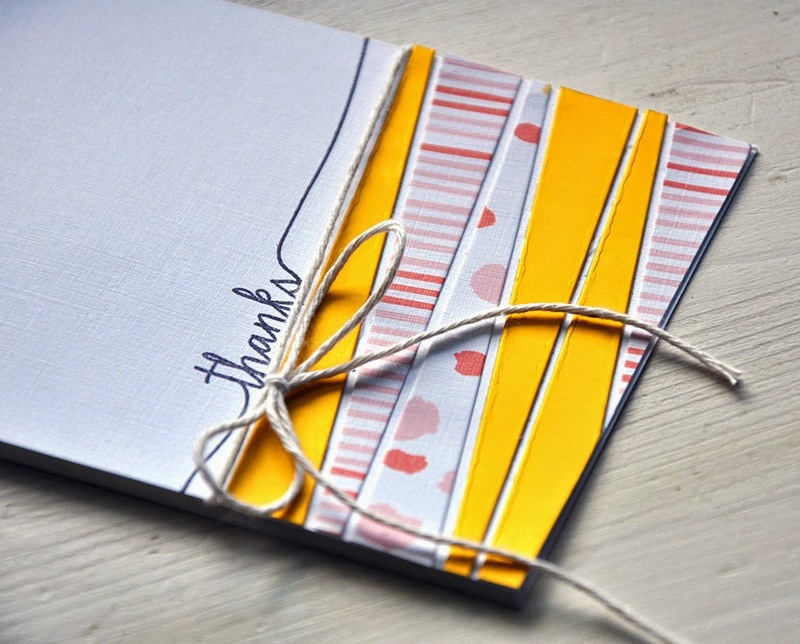 Topped them off with a "thanks" from the Swoosh stamp set and some cream baker's twine. 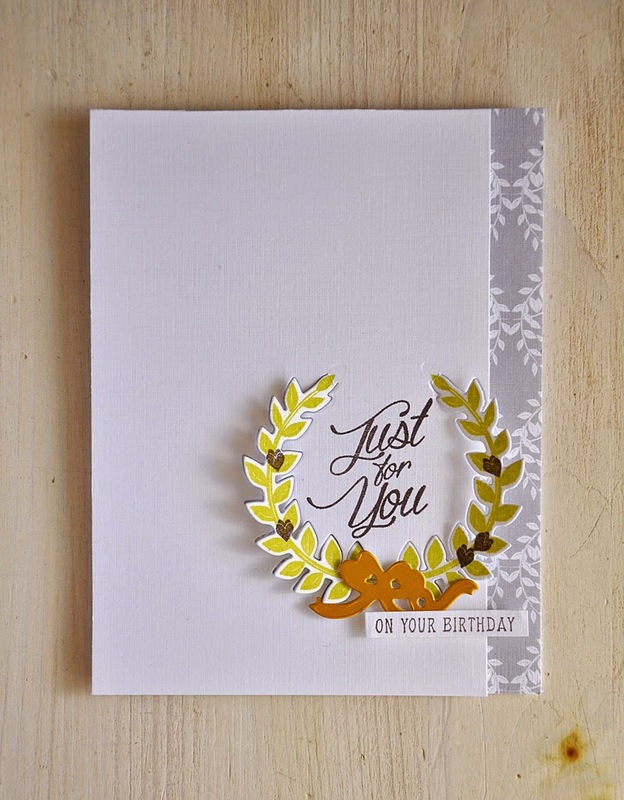 Finishing things off today with a card centered around one of the new Luxe Foil Gold papers. I carefully masked off a portion of the circle to allow me to stamp a butterfly within the gilded circle. The butterfly was created using images from both Beautiful Butterflies and Beautiful Butterflies Layers. I touched up the butterfly wings with a bit of Wink of Stella clear and then stretched a Swoosh sentiment across the front. Check out that shimmer! I'm loving all the shimmer I've had to share with you today! Well, that concludes my look at the Blue Skies stamp set & dies, Cover Plate: Blue Skies die and Cover Plate: Blue Skies Rays die. And of course a few samples of my new lineup for the month... Swoosh, Beautiful Butterflies Layers and Watercolor Wonder paper pad. Just remember... the products you've seen today will be available for purchase through Papertrey Ink, beginning February 15th. I'd love to know what you think of today's creations. I enjoyed Blue Skies so much! Even more than I initially thought I would. Anyways, you won't want to miss any of today festivities. So be sure to visit the Papertrey Ink blog. Hello and welcome to day 6 of the Papertrey Ink anniversary festivities! 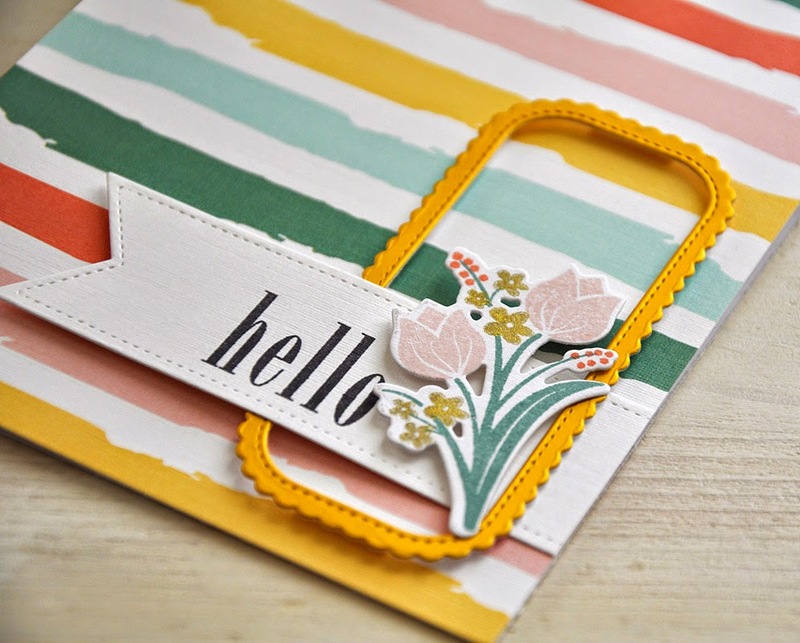 Today is another group post day and our focus is on the new Petite Places: Church and Scene It collections by Betsy Veldman! A unique and interactive tag is sure to make an impression. And this new series is sure to be a highlight of every release. Each piece is so versatile and I hope to show you what I'm talking about. 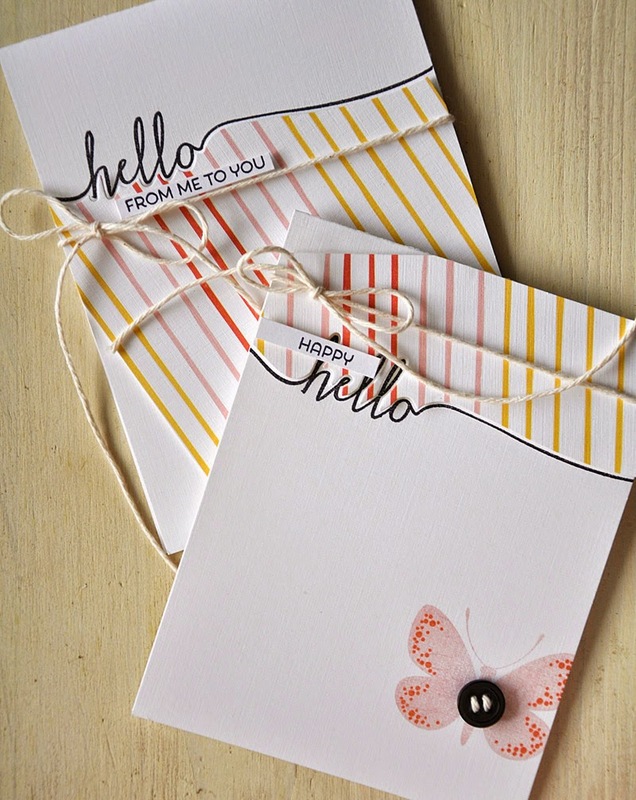 Find more info on these products on the Papertrey Ink blog. 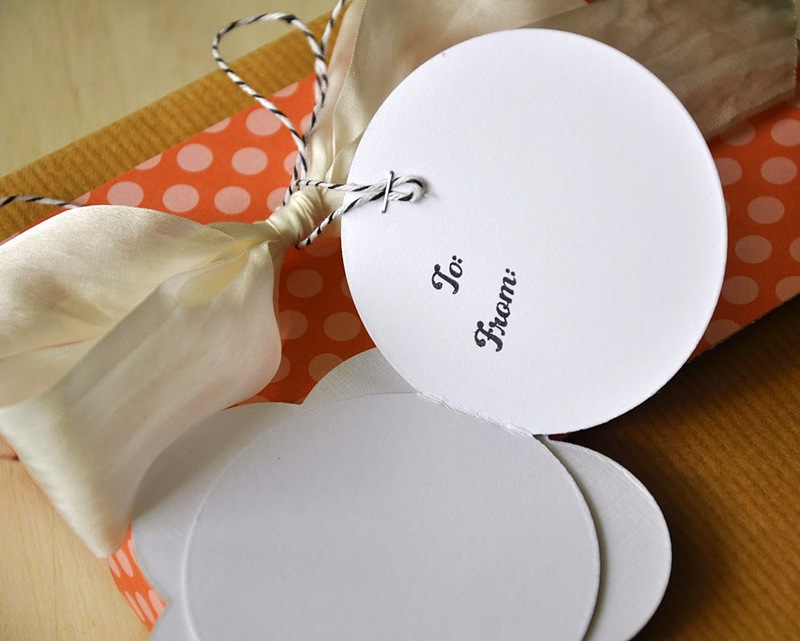 A dimensional dome tag is a great way to dress up a simply wrapped package. And Petite Places and Scene It collections make this possible. This month the focus is on a church, great for weddings, baptisms, Easter and so much more. I've gone with an elegant wedding theme. Inside the dome you will find a few Scene It: Skyscapes die layers. 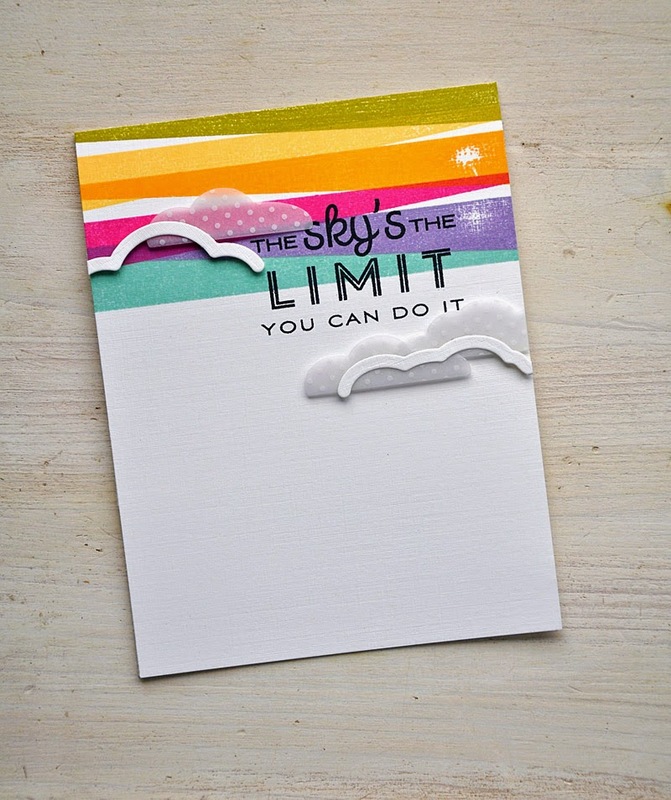 First, the clouds cut from white cardstock. Second, golden sun rays. This layer adds such stunning shimmer. 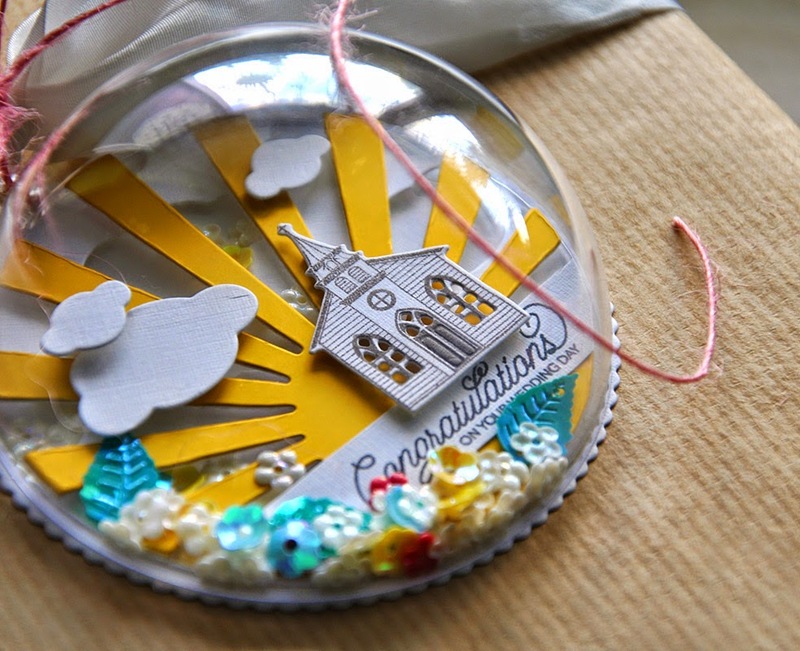 Third, a few more die cut clouds (left over from the first layer). The church front and sentiment top off the layers. Before attaching the dome lid, a bit of floral sequin confetti finished this tag off beautifully! 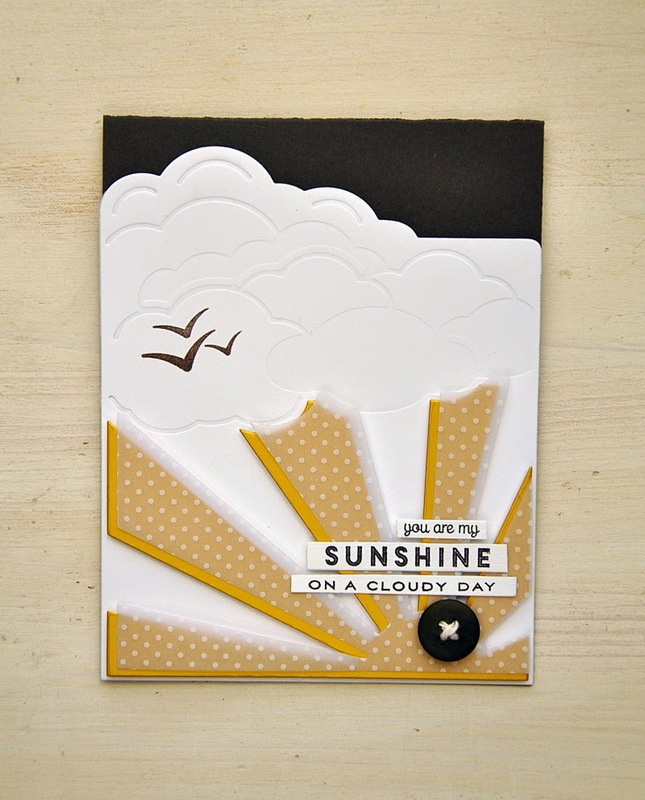 Speaking of versatility, these Scene It: Skyscapes dies are perfect for card fronts too. Creating a focal point is a breeze! Using the same sun rays circle as above, I was able to quickly create a simple backdrop for a Beautiful Butterflies butterfly. 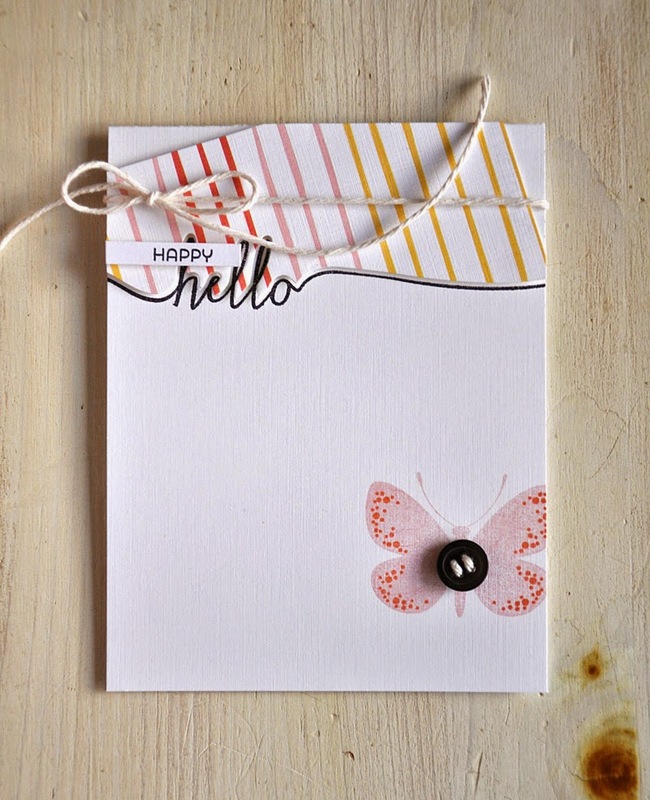 This butterfly was stamped with an additional coordinating layer from the Beautiful Butterflies Layers stamp set, in a color combo of berry sorbet and raspberry fizz. 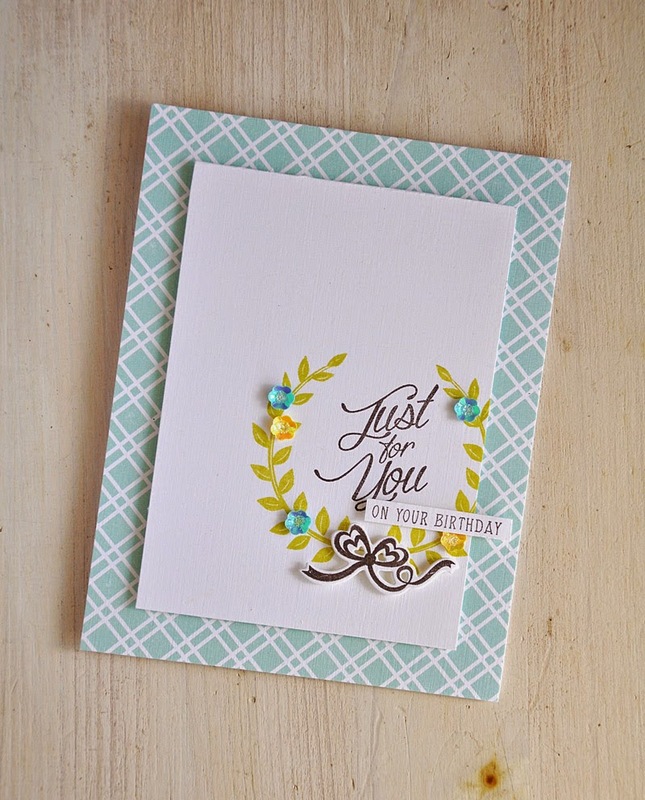 And this gorgeous sentiment is from the Petite Places: Church stamp set. 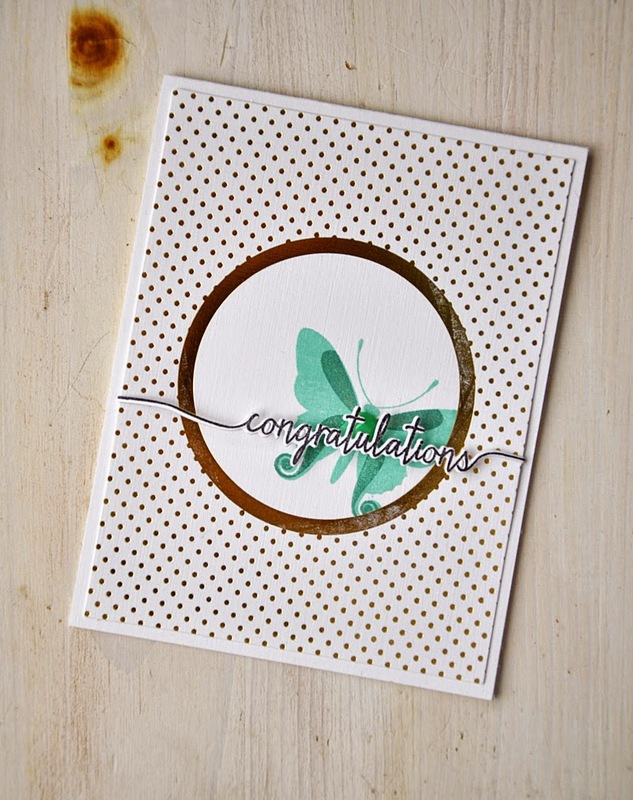 I'll quickly move on to a card duo featuring my newest Stamping Simply sets... Beautiful Butterflies Layers and Swoosh. Also, a bit of Watercolor Wonder paper pad too. 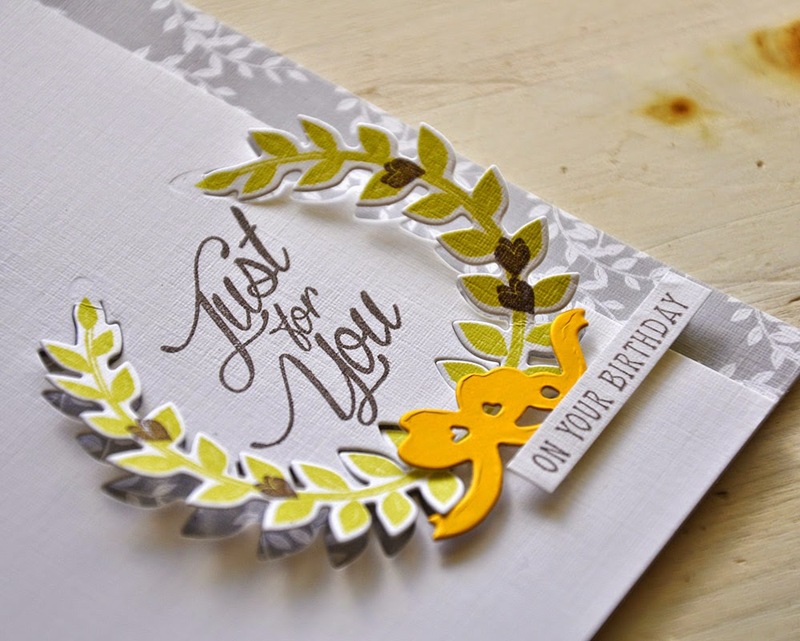 Both cards were creating using a single piece of pattern paper (measuring 5.5" by 4.24" from the paper pad), which was die cut into two pieces using the "hello" Swoosh die. 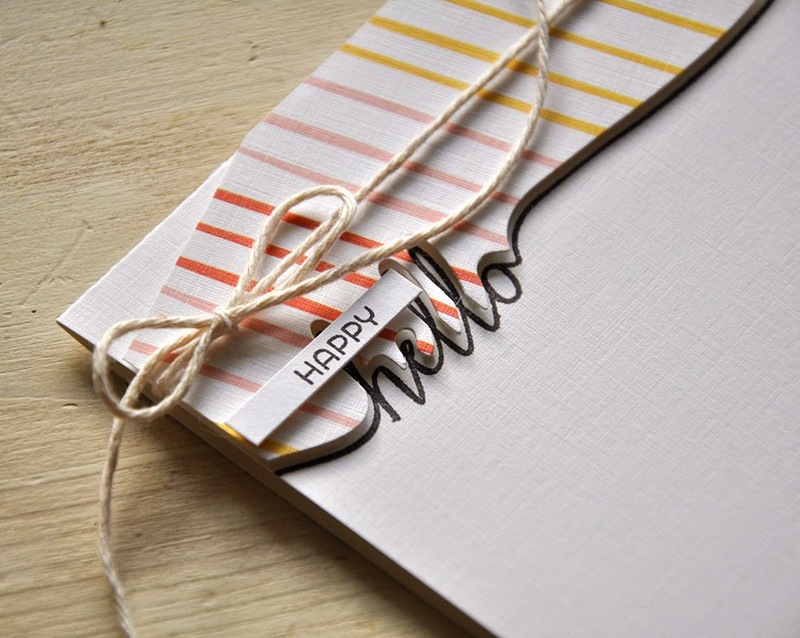 Here's How: I die cut the "hello" die from the pattern paper at a slight angle. 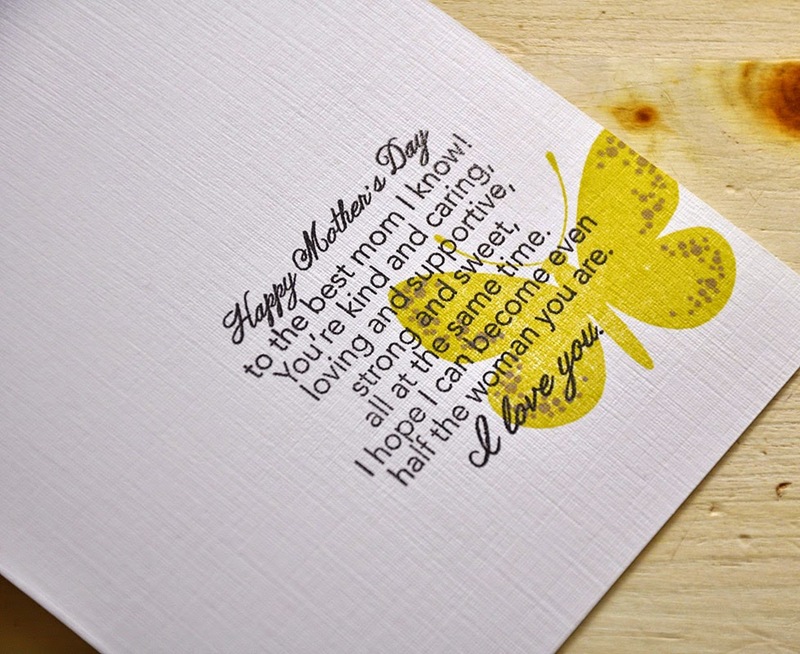 Then, when attaching the pieces to the card fronts, I made sure to line up the die cut edges along the stamped "hello". 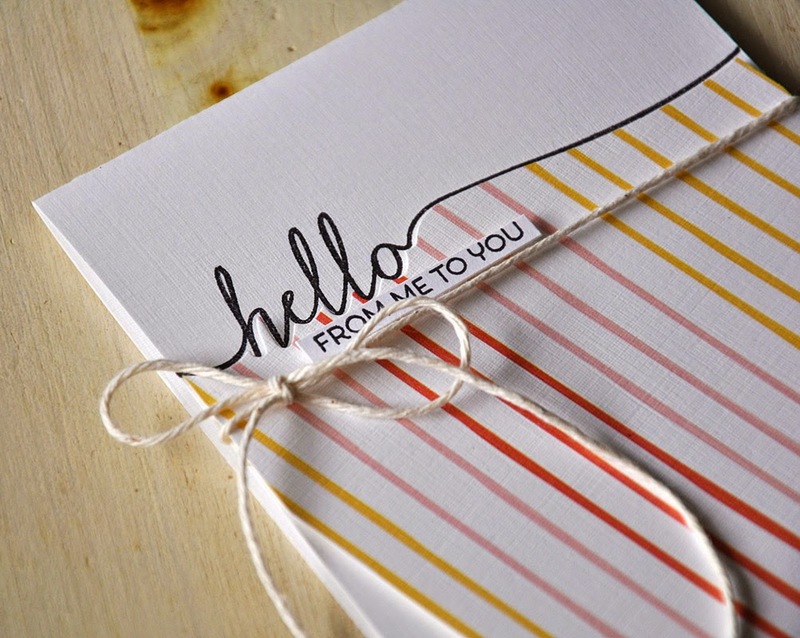 The stamped "hello", being stamped nice and straight, causes the pattern paper to have to be attached at an angle. The edges will hang over the edge, but they are easily trimmed away. 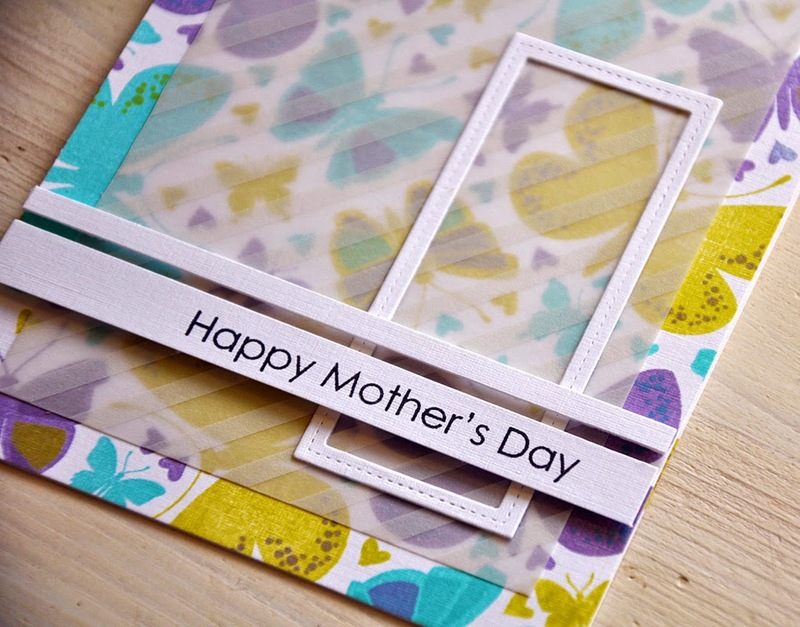 This card features the bottom portion of the die cut pattern paper. 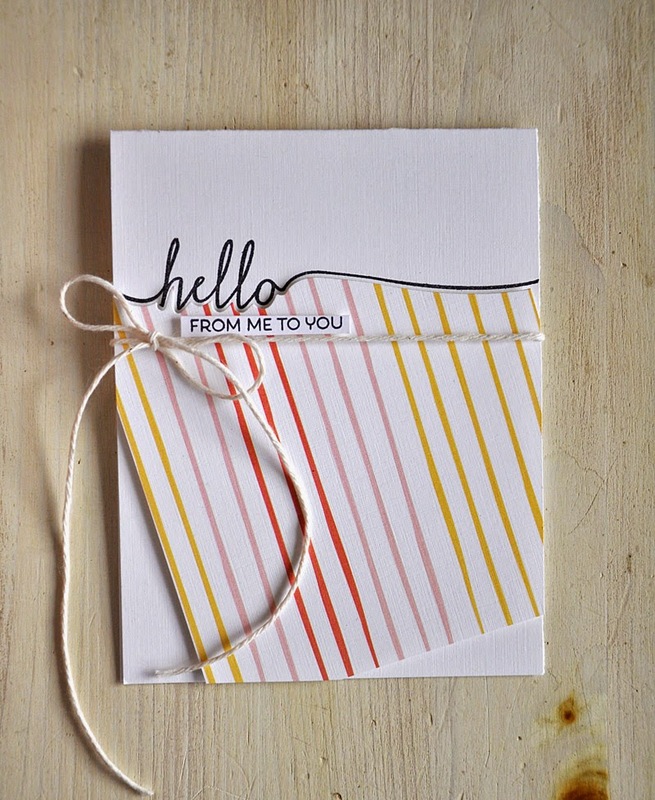 I finished the card off with a "from me to you" sentiment strip and a wrapping of cream twine. 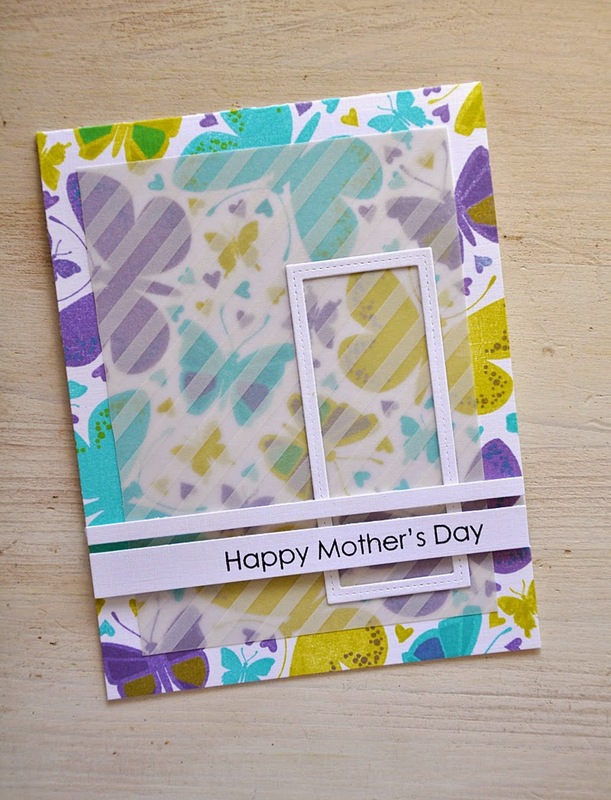 This one features the top portion of the die cut pattern paper. 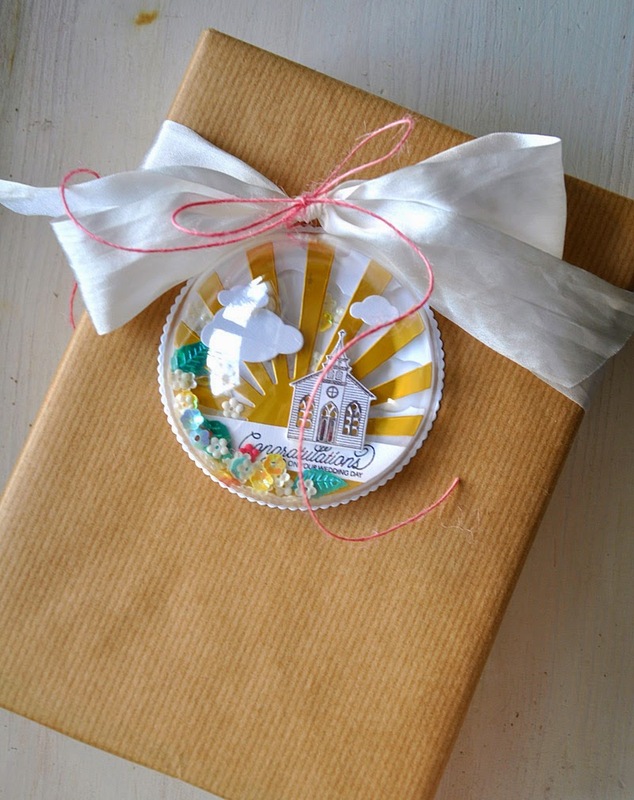 The top was embellished with a "happy" sentiment strip and a coordinating wrapping of more cream twine. The final touch is a layered butterfly, using images from both Beautiful Butterflies and Beautiful Butterflies Layers. Plus a smokey shadow button. Well, that concludes my look at the Petite Places and Scene It collections. Just remember... the products you've seen today will be available for purchase through Papertrey Ink, beginning February 15th. Hello and welcome to day 3 of the Papertrey Ink anniversary festivities! First, let me begin by saying... I am so wonderfully grateful for the support and comments you've shown me over yesterday announcement. Couldn't be more thrilled to know that my excitement for the new year is share with all of you! Thank you from the bottom of my heart! Today is the first group post and we are all about the new Enclosed series! By Dawn McVey. 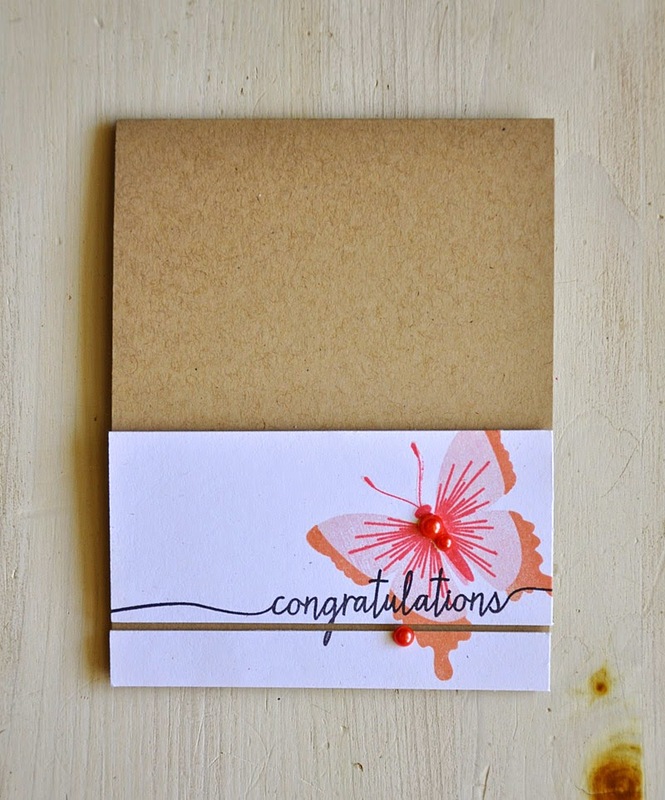 This is an amazing concept for the new year, and one that fills a hole in my stamping collection. I'm already looking forward to the next one! Find more info on this series on the Papertrey Ink blog. First up, the intended use of this months Enclosed: Flower collection. 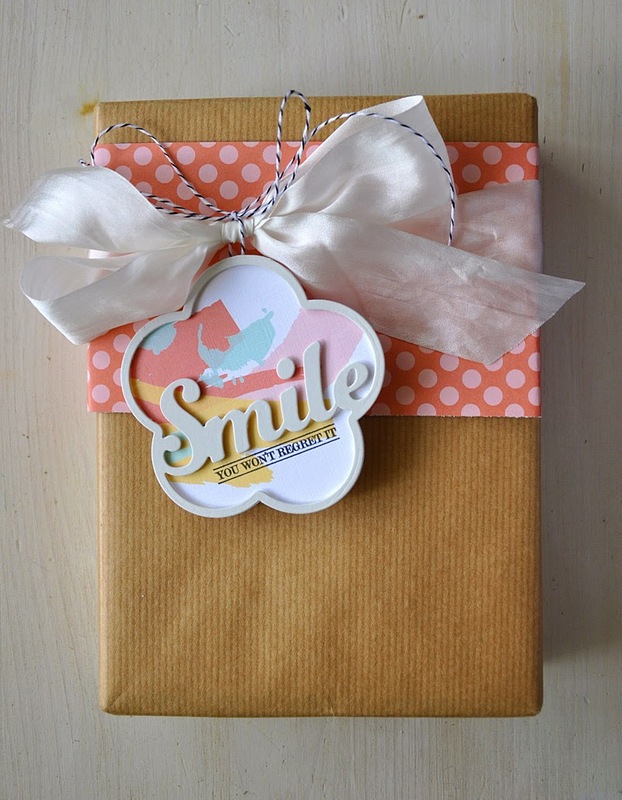 This gift box was wrapped with two strips (ends tapped together) of melon berry pattern paper. 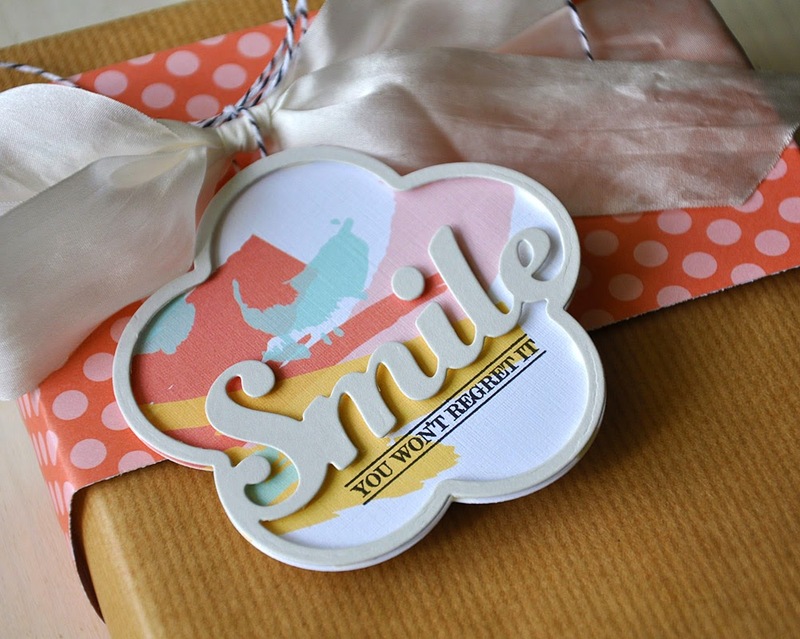 The "smile" frame was die cut from soft stone and the flower base was die cut from a Watercolor Wonder paper pad sheet. The black Baker's twine was attached using a Tiny Attacher. 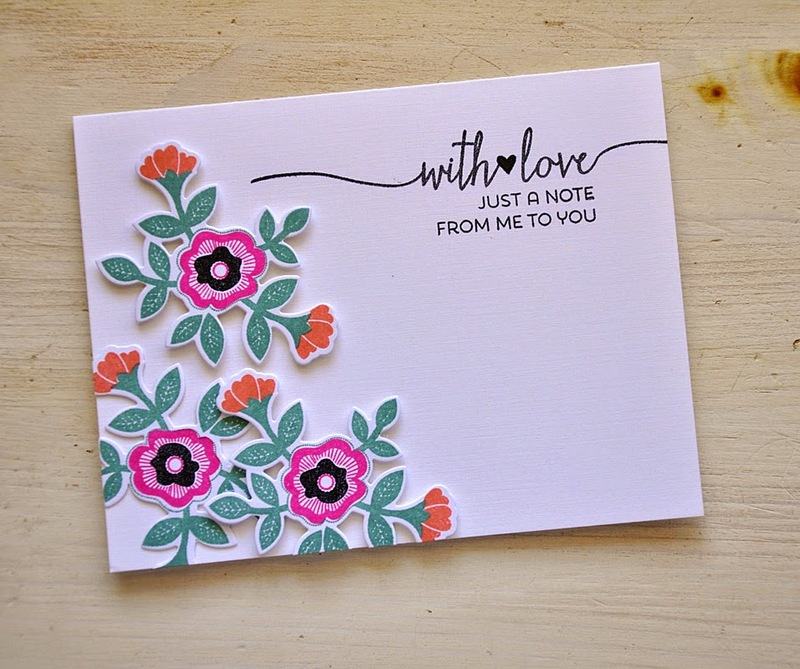 The Enclosed: Flower stamp set makes great cards too. 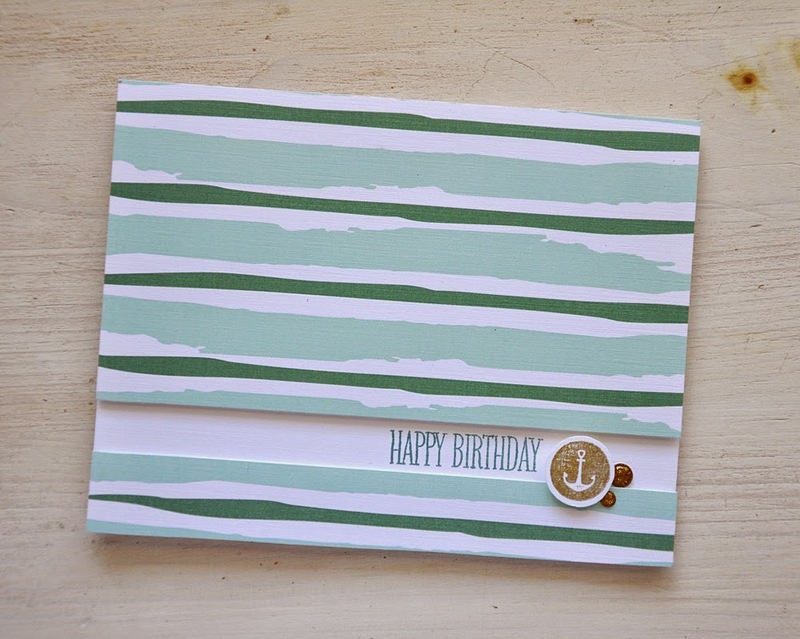 The stripy base of the card was created using a Watercolor Wonder paper pad sheet. 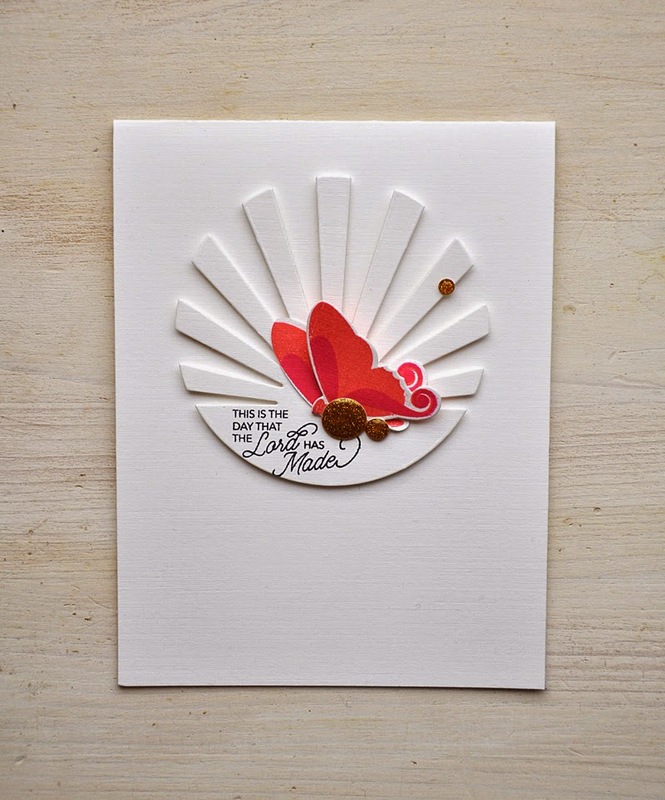 This beautiful focal point was created using the petal pieces included in the coordinating stamp set. 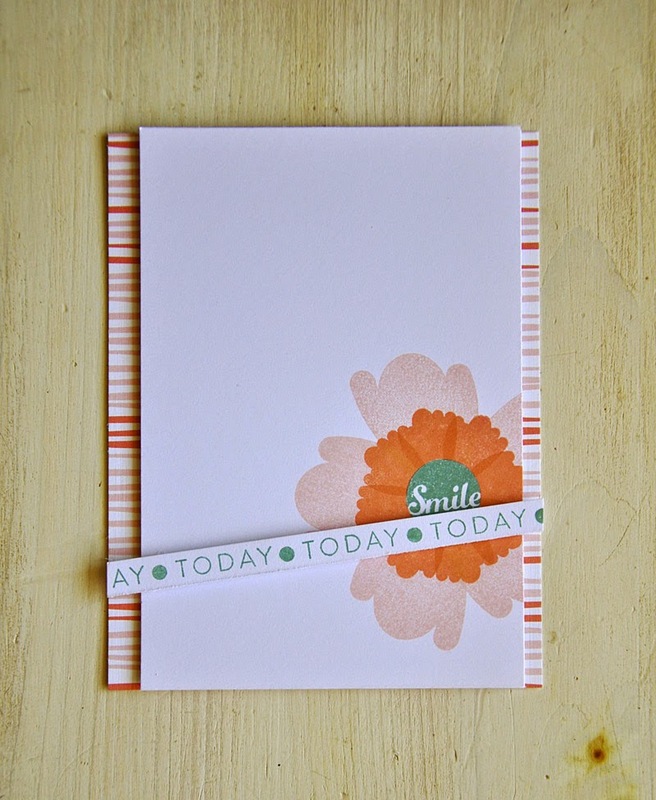 Very clever to include a "smile" circle for a flower center in this versatile stamp set. 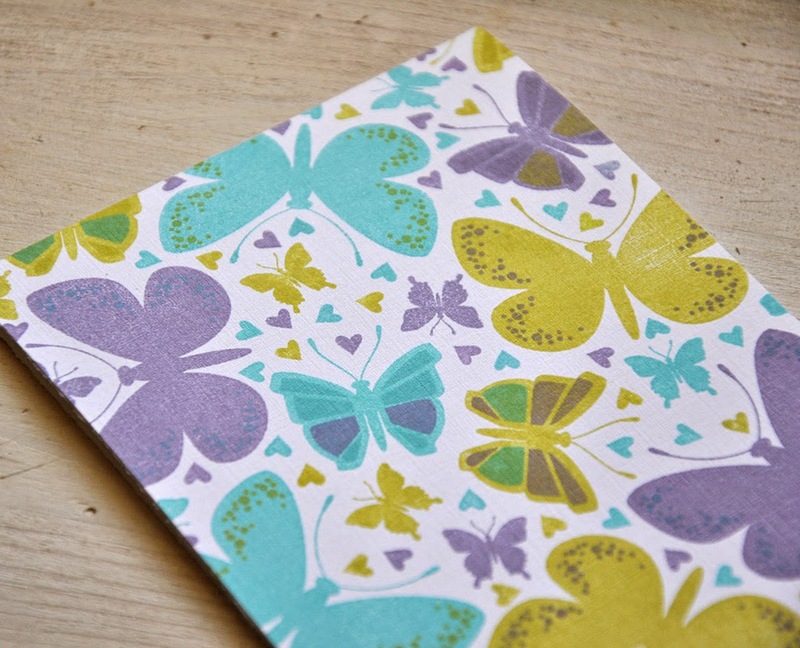 Today, I'd also like to feature a second butterfly and its coordinating layers included in the new Beautiful Butterflies Layers. 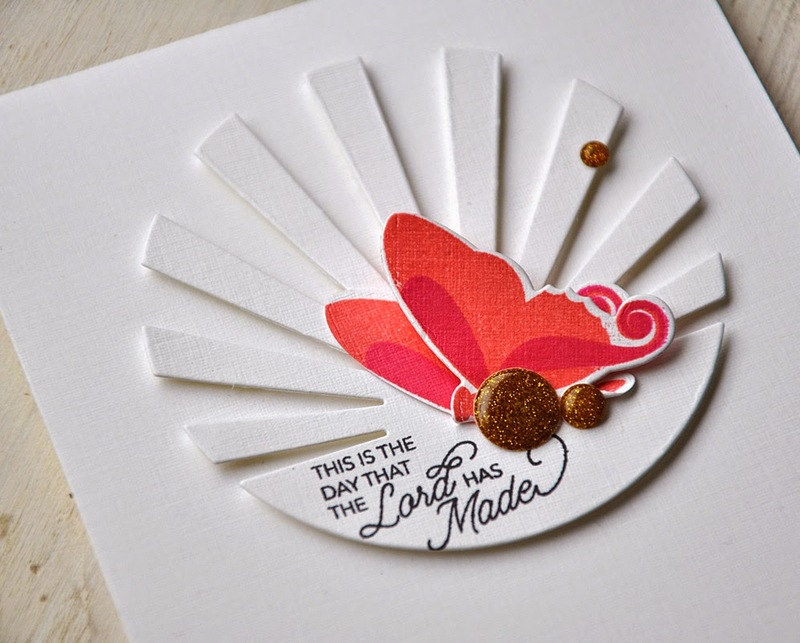 Two layers are included for this particular butterfly, the outer edges and starburst center. 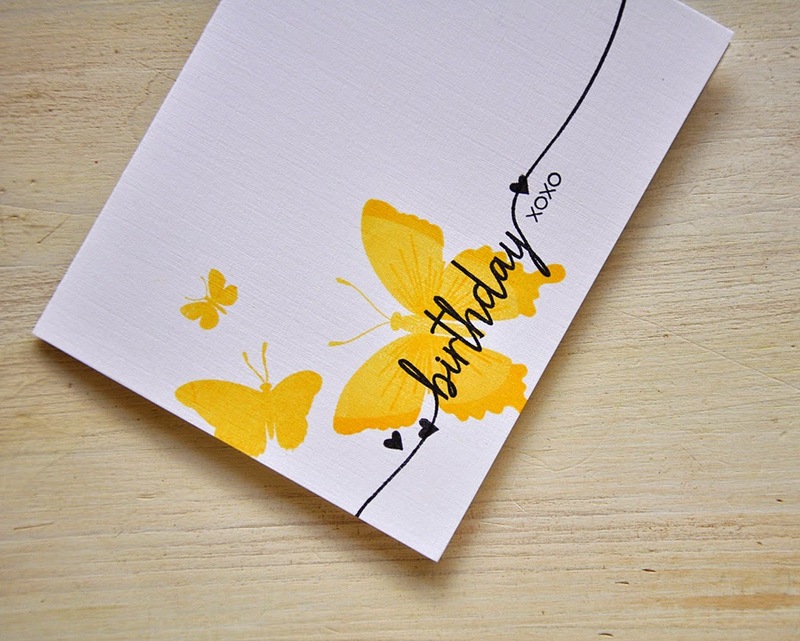 Here the base butterflies (from Beautiful Butterflies) were stamped in one color (harvest gold in this example) and the layers were stamped in the same color too, this layering of a single color gives the butterflies a delicate touch of detail. 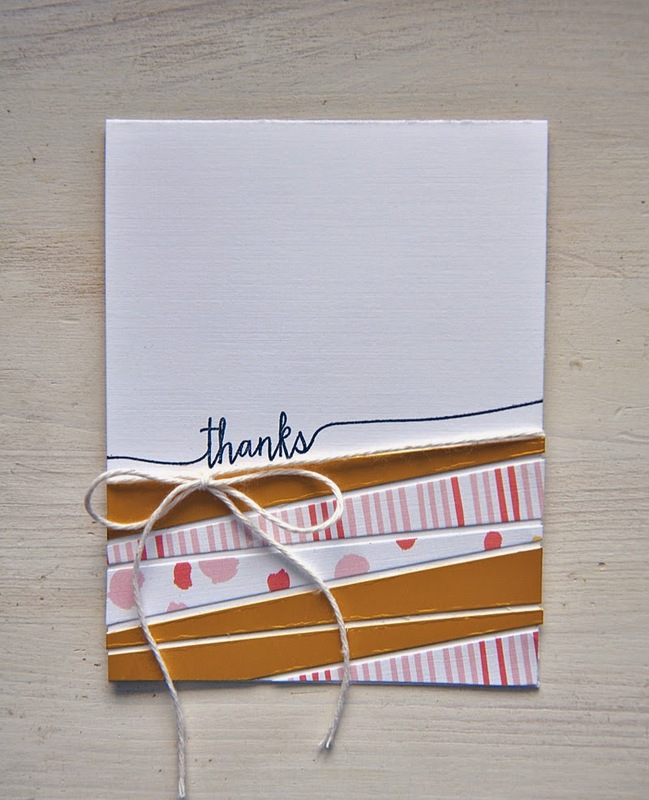 Here I've created a card trio in the colors of sweet blush, ocean tides and harvest gold. 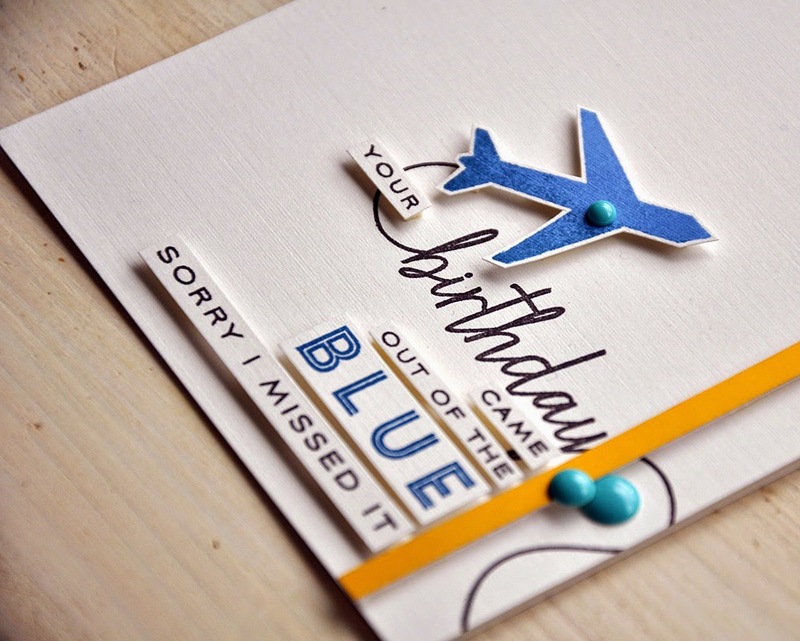 Each one features a slightly different birthday sentiment, each one included in the Swoosh stamp set. The hearts too. 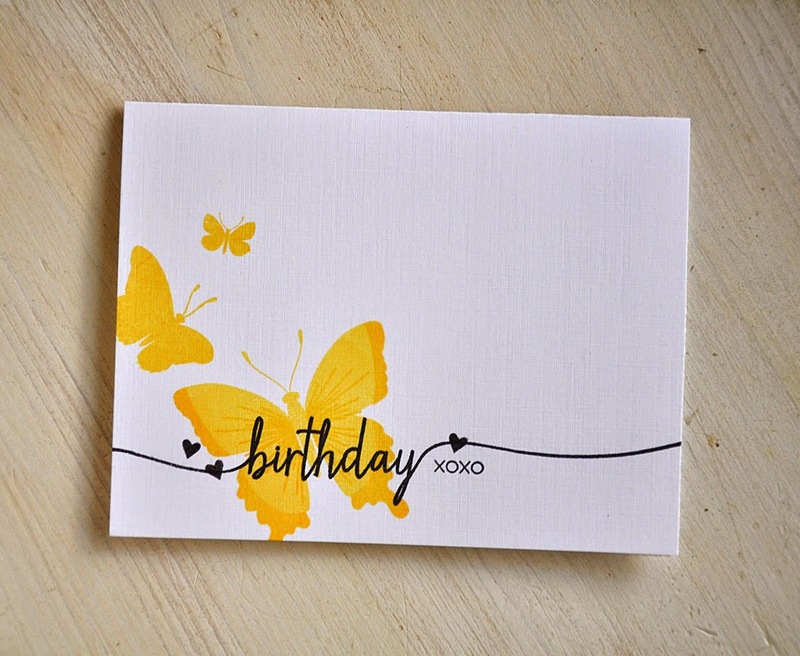 This last card uses the same butterfly stamps, but takes a different color approach. This butterfly was stamped in three different colors... the base in sweet blush, edges in melon berry and both the body and starburst center in berry sorbet. Well, that concludes my look at the Enclosed: Flower collection. Just remember... the products you've seen today will be available for purchase through Papertrey Ink, beginning February 15th.